I love to walk. I’m not talking epic, adventurous, multi-day hikes through remote wilderness. I just love the walk down to the shops, the quick round-the-block with Jack in his pusher, the stroll by the lake. I have been without a car for long periods of time at various times in my life, partly because I spent so many years as a poor university student, but also because I just prefer walking. I’ve walked through hard decisions and loneliness that seemed endless. I’ve walked to nurture ideas, to hone poems, to find the right words in my head. I’ve walked to meditate. I walked to survive finishing my thesis. I walked to recover from a miscarriage. As soon as I could after Jack was born, I got up and walked down the hospital corridor. Not far. In my pyjamas. In pain. Not fast. But on my own two feet. When you walk, you’re not dependent on anybody or anything. As long as I can keep walking, I know that I can keep going. Also, you see things differently when you walk. It’s true! A recent study by Stanford University indicates that walking boosts creative thinking. Walking is my best time for daydreaming about my story. I let my mind wander and wonder about the world I’m creating, the characters, what’s about to happen, what could happen. When I walk, I’m letting myself take time. For me, that’s a way of claiming my life as my own. Walking is almost never the quickest way to get somewhere, but I encounter things that I wouldn’t otherwise. Where I live there’s a lot of concrete. The building adjacent to my apartment complex is heritage-listed 1970s brutalist architecture. It’s monolithic. It dominates the surroundings. Until I started exploring on foot, I never knew there were so many birds sharing this neighbourhood too: cockatoos squabble in big gangs on the median strip, rosellas and galahs dig in the dirt for seeds. 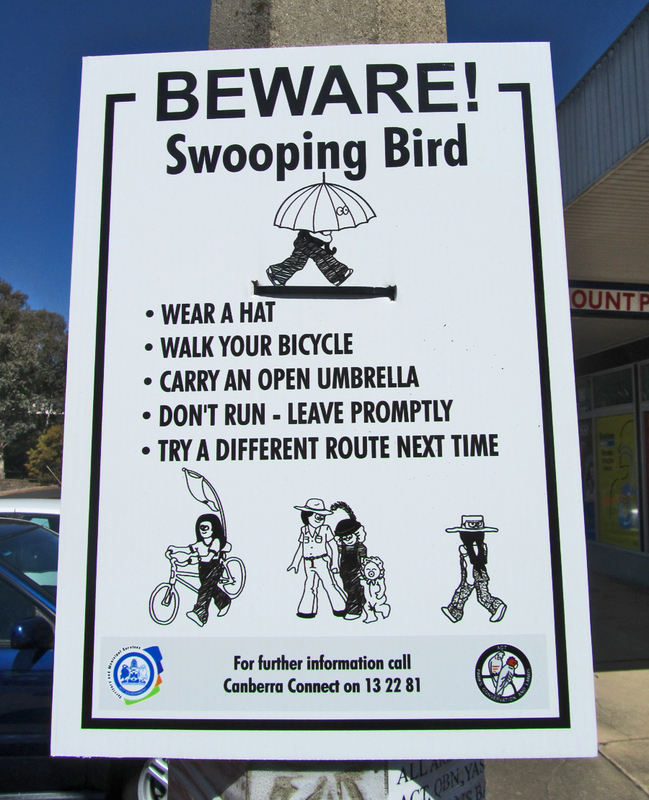 A magpie watches me from a tree, near a warning sign that instructs me to carry an umbrella, to wear a hat, not to run. There are crows and ducks and seagulls too, and that’s before I even reach the lake. Walking reminds me that things pass. Seasons. Problems. Fears. I keep covering the same ground but the ground keeps changing and I keep changing. Because I walked through winter, I knew, even as the winter seemed endless, that spring was coming. I saw wattles forming soft buds. I was ready for the day they exploded into yellow. Perhaps this is why I’ve been feeling uninspired lately. I been driving much more and walking a lot less than I usually do. I’m planning on getting back into it properly this week. I really find it helps. It’s the best time out. And so gorgeous at the moment too.